As a manager one of my pet peeves is when a new or established employee does not take notes as they are learning something new and then later asks someone for help because they cannot recall how to do the task. I supply all of my employees with notebooks for their personal note-taking from day one. It is impossible for anyone to remember everything when they are learning a new job or job task. By taking their own notes, they will be able to refer back to them if they forget or need direction in completing an already taught task and will not take up someone else’s time asking for help. 1. 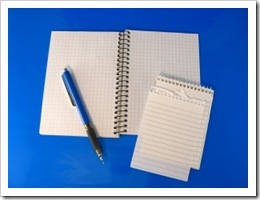 Paying attention: Whether you are asked to take notes or not, you should take notes. Unless you have a photographic memory your notes will come in handy at some point. An employer sees not paying attention as a lack of initiative by the employee when it comes to their job education. Employers frown upon employees who think it is okay to interrupt and take up another employee’s time to help them with a task that they should have written down the instructions for in the first place. To the employer you are costing additional money as he or she is paying for the extra help that you now need. You will be surprised how your employer will notice when you do pay attention to what is being taught and what is going on in the business. 2. Learn to do your job well: Learn all aspects of your job and learn how they affect the business as a whole. Do your job well everyday. Employers take note when employees slack off once they learn their job tasks. Take pride in your work and your employer will be proud to have you as their employee. 3. Be organized: Keep your work area clean and uncluttered. If allowed, develop a system that works for you to be able to work efficiently. Be able to get what you or your boss needs at a moments notice. Employers become concerned when they see a messy work area. There is a higher chance that work can be misplaced or lost when an employee is unorganized. When your workplace is uncluttered and organized it frees up your mind to work more productively and that is what your employer wants. This entry was posted on Wednesday, May 13th, 2015 at 8:00 am by Tina Del Buono, PMAC. Filed under Educational Tips, Self-improvement. You can follow any responses to this entry through the RSS 2.0 feed. Both comments and pings are currently closed.